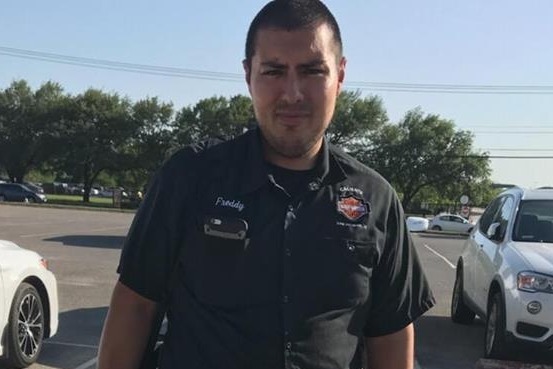 On May 15th, 2018 at 8 pm on Highway 211 near Briggs Ranch, Freddy was on his way back home on a motorcycle. Only five minutes away from home, a car turned out in front of him and hit the motorcycle. The impact was violent, and Freddy sustained very serious injuries. 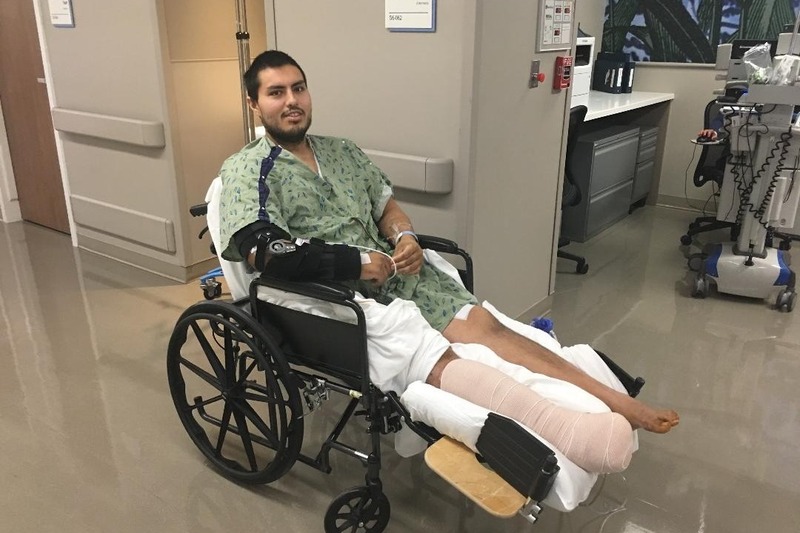 Freddy broke all of his toes on the left and the right foot, sustained an open fracture to the right leg, a broken pelvis, a broken right wrist, a broken elbow, along with a broken tailbone and several spinal fractures and a lacerated kidney and liver. Freddy was bleeding internally when he was rushed to the ER at University Hospital in critical condition. He was immediately rushed into emergency surgery to find and stop the bleeding. Freddy has received over 13 units of blood and was in the OR for around seven hours. He has had more then seven additional surgeries on his leg to clean and try to fix it. A metal rod was placed in his right leg. A skin graft was used to close the wound on the leg. Freddy has had surgery to fix all his toes with pins and screws. More pins and screws to the pelvis, the wrist and a new elbow plate. Freddy was in ICU for many days and is still waiting to see if he will lose his foot due to low blood flow. He will lose his toes on his right foot. 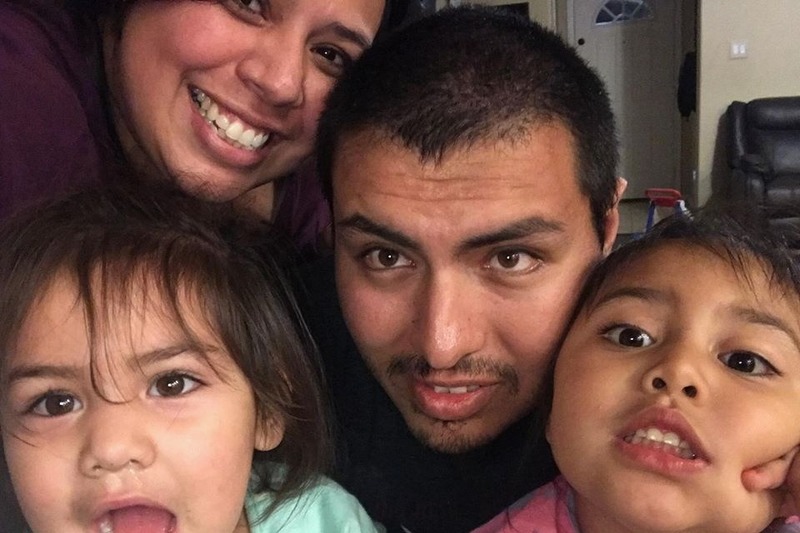 Freddy is still undergoing more surgeries and procedures to get out of ICU and back to his family, especially his two young daughters. We are all hopeful he will make a full recovery. 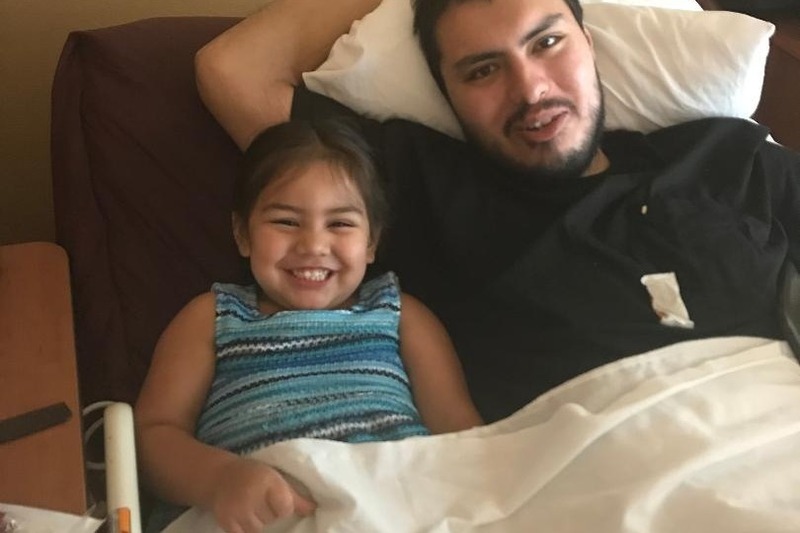 There will be many long days of rehabilitation in Freddy's future and at this time Freddy cannot walk or work to help his family. Freddy loves to work on motorcycles, and works at Harley Davidson as a technician. He has a passion for woodwork, and can fix nearly anything. 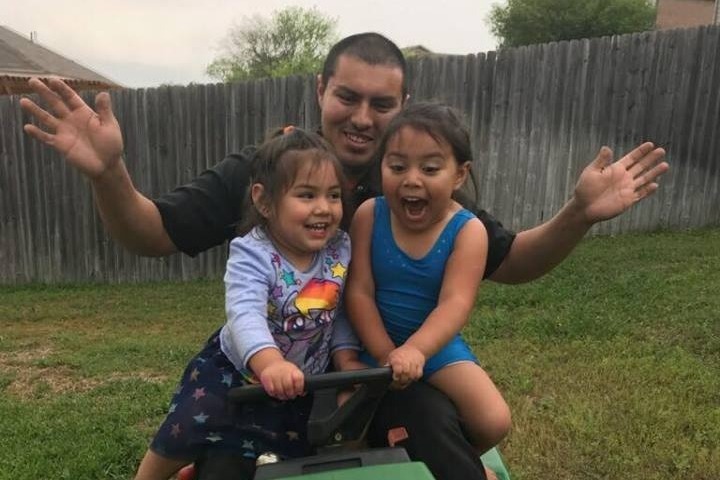 He transferred to San Antonio from Dallas for his current job, and met his partner, Christina, and step-daughter Victoria. Freddy and Christina have two little girls together, Luna (3) and Ariana (2) . On his days off Freddy loves to spend them with his girls going to the park to explore, taking them to Sea World to cool off in the water, teaching them how to swim, and any kid-friendly activity he can find to have fun with his girls. Freddy won't be working for a long while and even though Cristina is a nurse, she will need to keep the family financially afloat. 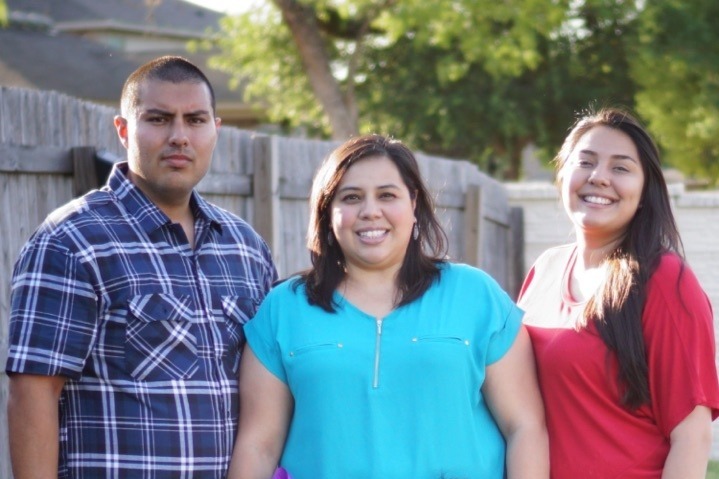 We are asking for any donation to help this beautiful family. In the future Freddy will have more surgeries, rehab and the bills will continue to add up through it all. We ask that you please donate what you can and to share this page for the family. We will continue to update on Freddy's progress and we ask that you please keep Freddy and the Serrano Family in your prayers. It has been a long journey already and no doubt a long recovery yet ahead. Freddy and I want to thank all the family and friends for all the support, visits, well wishes and prayers. Freddy is finally out of the hopsital after many surgeries and effort to try and save his foot. His last surgery was to amputate part of the right foot, but he is well on his way to recovery and is not letting this get him down. Freddy is currently at a skilled nursing facility where he is healing from all the surgeries. Hopefully soon he will be released by the doctors to go to a rehabilitation center. 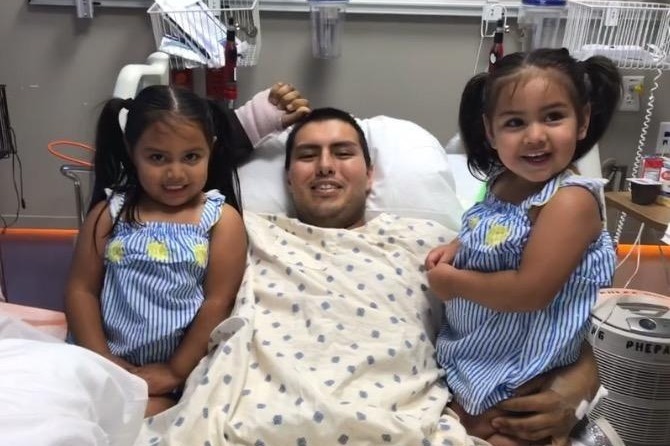 Freddy's motivation is his two little girls, which he cant wait to get home to. Freddy has alot of hard work to do and is more then ready so he can get home to play and chase his little girls around like he use to. Again, thanks to all who have donated. This will help with a prosthetic in the near future. Hello everyone! On behalf of Freddy and his family we would like to express are sincere gratitude to everyone who has donated towards our goal and who has shared our page. At this time we have increased our goal to further help the cause that is very much in need. Please continue to share and keep Freddy and his family in your prayers. Freddy is out of trauma ICU and has been down graded to an Acute Care Floor. He is still ongoing with additional surgeries and recently had another graft revision to the right leg. Freddy had not been allowed to see his girls for a month and today, got that special visit. He is alert and awake and very hopeful. 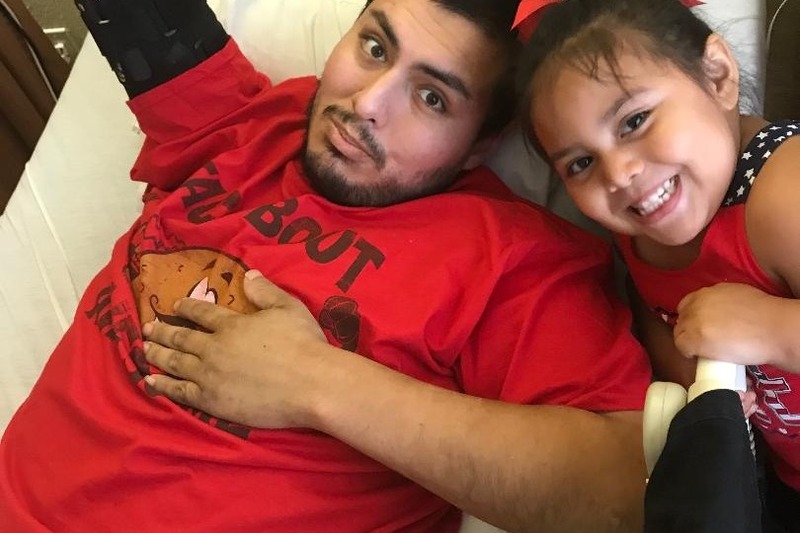 He is also aware that he has a long road to his recovery and is willing to do what is nescessary, to be able to walk again and return home to his family. We will keep you all updated on Freddy's progress. God Bless and Thank You All Again.